Home » Service Manual Catalog » EPSON Adjustment Programs » InkJet printers » AP_t40 I have paid for Reset Key but not received yet. Epson T40W Service Adjustment Program New! The Epson Adjustment Program for Epson T40 can be used under Windows only (Millenium, 2000, XP, Vista [in compatibility mode]). 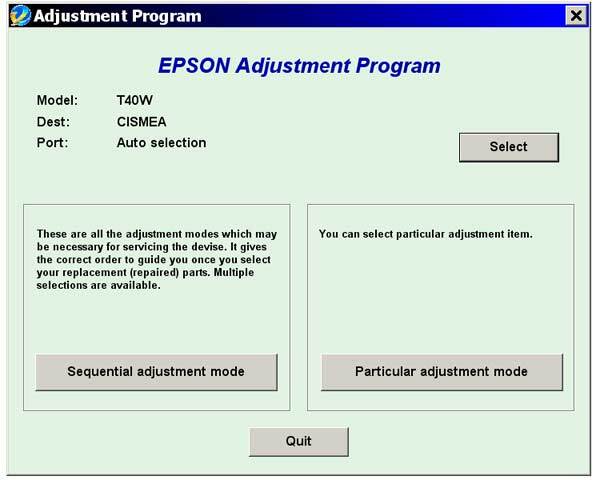 We recommend reading the Epson T40 Service Manual before using the adjustment utility. It work very well for my TX720WD! This is easy step to save your time and money. Successful reset in 2 minute after payment by paypal. Thank you! :) This actually works and its really helpful. Hat alles super geklappt und sogar ohne gro�e Englisch Kenntnisse. Bin begeistert immer wieder. Epson has a new printer. XP-15000. It would be good if we could reset the waste ink for it. Notify me of updates to Epson T40W Service Adjustment Program New!